Corn is a vegetable that you can freeze, or process by canning to preserve. It retains is natural sweetness and is easy to reheat in boiling water for a fresh picked flavor that can’t be beat. You can freeze it on or off the cob. Either way is fairly simple. There’s nothing quite like the flavor of fresh picked, sweet corn. When you smear it with melty butter, salt and pepper, you have the taste of summer in a symphonic crunch that can’t be beat. However, corn growing season is short, and the cobs do not last very long once picked. The only way you can enjoy it’s full flavor all year long is to preserve it. 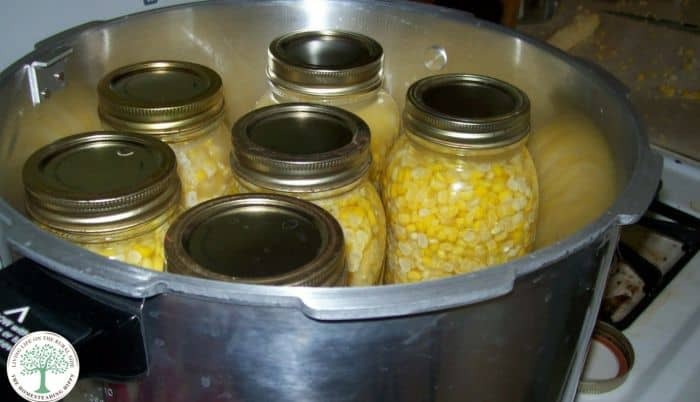 There are 3 ways you can preserve your corn- freezing on the cob, freezing off the cob, and canning it. Place ears into boiling water for 10 minutes, then immediately remove to ice water bath for 10 minutes. Allow to cool completely and air dry for 10 minutes. Store ears in air tight freezer bags, removing as much air as you can. Label and date, and store in freezer for up to 1 year. Shuck the corn, removing silk and outer husks. Place the ear of corn on a bowl inside another bowl and carefully slide a knife down the cob, removing the kernels. Dunk the corn kernels in the boiling water for 5 minutes, then immediately remove to ice water bath for 5 minutes. Drain the cooled corn, the store in air tight freezer bags, removing as much as as you can. Now, what happens if you don’t have a lot of freezer space? What do you do if you are concerned about your power going out for an extended period of time, such as during hurricane season, winter storms and more? How do you save your garden produce without worry? 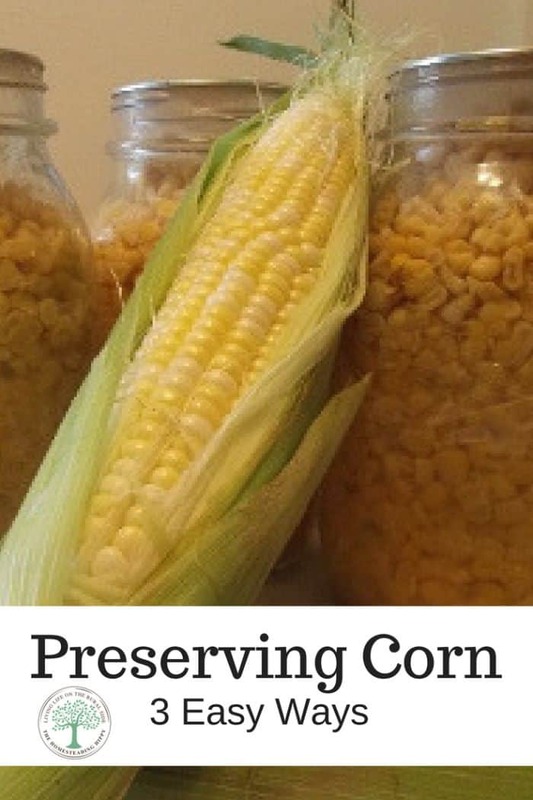 You can preserve your garden corn by canning it! Corn is a low acid vegetable and MUST be pressure canned for safety. There is no way to safel​_y water bath corn, no matter how long you keep it in the water bath canner. Pressure canning is the only way to kill of botulism spores. Your food would not look spoiled, and you may not smell any difference if there is botulism present, but someone getting sick could very well happen. Sure, Grandma may have done it that way back in the day, but since we know more about bacteria and food safety, there’s no reason to take a risk. To see more on how to use your pressure canner, read the post here. Here’s how to can corn for pantry shelf stable storage. 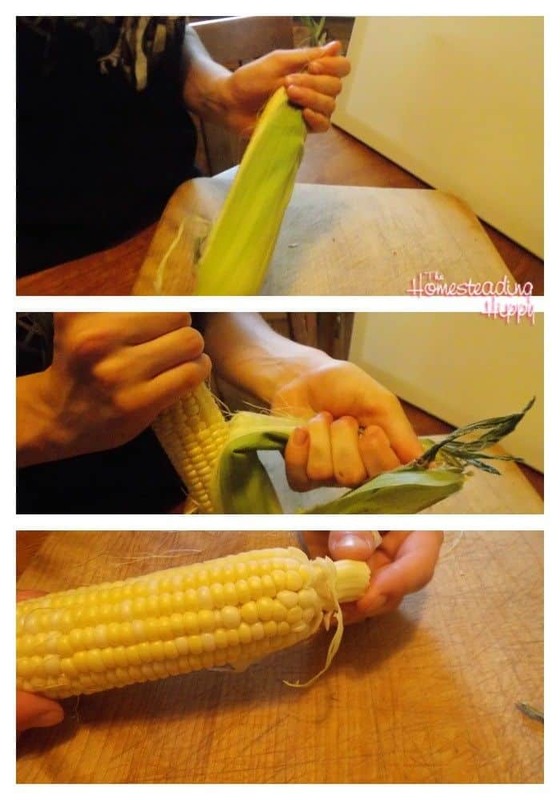 Shuck your corn, removing outer husks and silk. Carefully place the smaller bowl upside down inside the larger bowl. 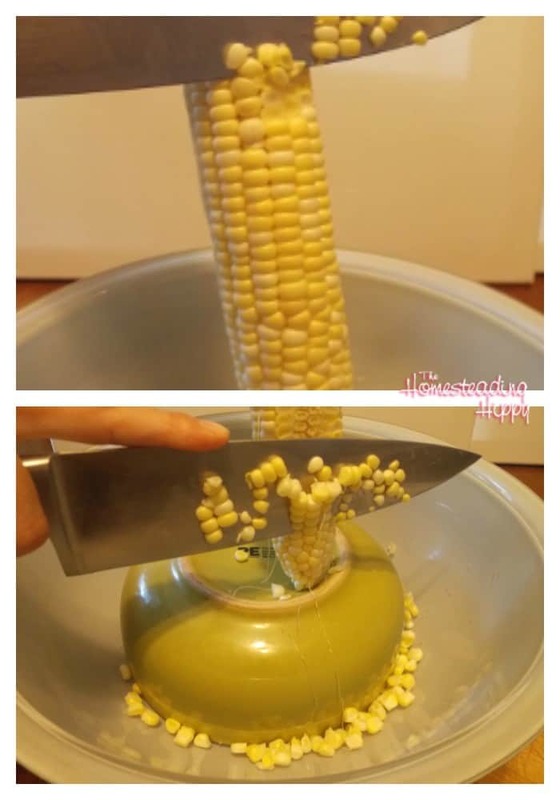 Slide your knife along the cob, removing kernels into the larger bowl. Fill your jars with the corn, not packing tightly. Add about 3 1/2 cups of corn per quart jar. Add boiling water to the corn, leaving 1 inch headspace on the jar. Wipe the lid with a damp towel to remove any residue. Place a new lid on top of the jar. Screw the band down finger tight. Process in pressure canner at 10 lbs. pressure 55 minutes for pints, 85 minutes for quarts. Allow canner to cool, then remove jars to towel. After 24 hours, check for proper seal by pressing down on the middle of the lid. Any that pop back up need to either be reprocessed or stored in the fridge and used within 3 days. Wipe down jars, remove bands, store for up to 1 year in a cool, dry place. We canned almost 200 ears of corn last weekend. We froze a few ears also, but we like the texture better when it’s been canned. Great post! I love this idea, I’m going to try it this week! Just wanted to let you know that this was chosen as the featured post this week. Stop by and grab a featured badge for your blog. We hope you’ll stop back this week!